Need an amazing advanced string trick yo-yo that won't break the bank? What about a yo-yo that can still play responsive for the beginner or intermediate player? We got you covered there too. 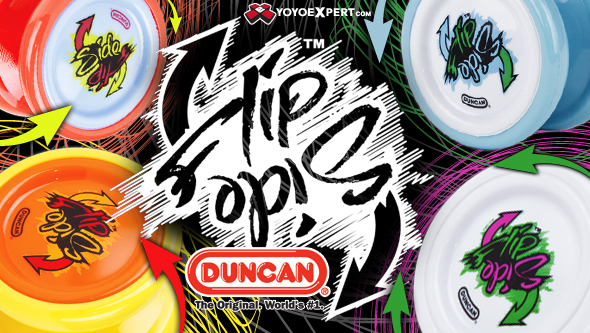 Introducing the all new Duncan Flipside! The all new Flipside features a 'patent pending' ball-bearing spacer system that allows yo-yo players to use either a small OR large ball-bearing in a single model! Whether you are looking to learn the basics or jump into advanced play this is the yo-yo for you! Based on the original specs of their popular Freehand Zero, the Flipside features a modern profile with Silicone Groove Sticker response for unresponsive play. Install the included KonKave bearing (officially licensed by Dif-E-Yo yo-yos) and you'll be throwing one of the best plastic yo-yos on the market! EACH Flipside includes BOTH a large completely unresponsive KonKave ball-bearing AND a small ball-bearing. Go responsive to unresponsive with just a flip and get ready for a very fun new throw!